Contractors specializing in Firestone Roofing, Commercial Roof Repair, Commercial Roof Construction, and all other Firestone Commercial Roofing Services in CT. Call 1-888-766-3020 for a Free Quote. Firestone produces single-ply and asphalt-based roofing membranes, polyiso insulation, and a full line of roofing accessories. Contractors, building owners, architects and specifiers have trusted Firestone Building Products as the leading, single source for superior commercial roofing systems for 30 years. From research and development through product manufacturing, Firestone follows stringent quality control guidelines to ensure each component of a Firestone roofing system meets or exceeds industry standards. New Roof Connecticut’s licensed and insured roof contractors have years of quality commercial roofing experience in Fairfield, Middlesex, New Haven, Hartford, New London, Litchfield, Tolland, and Windham County. We service all types of buildings and market segments including commercial offices, government buildings, medical offices, hospitals, schools, banks, industrial buildings, residential homes, commercial buildings, housing associations, and apartment buildings. Call New Roof Connecticut 1-888-766-3020 to learn about our Firestone roofing solutions or request a Free Commercial Roof Quote. Firestone's single-ply EPDM roofing systems are based on a high-performance synthetic rubber compound that provides outstanding weathering characteristics in climates worldwide. It is the most popular material for both new and reroof low-slope roofing applications. Firestone's line of EPDM Systems include RubberGard EPDM, RubberGard Platinum EPDM, RubberGard EcoWhite EPDM, EcoWhite Platinum EPDM, EPDM PT Membranes, and RubberGard R.M.A. From office buildings and distribution warehouses to hospitals and schools, Firestone has an EPDM roofing solution that’s right for you. Thermoplastic single-ply roofing membranes are among the fastest growing commercial roofing products and have gained broad industry acceptance for their many performance and installation advantages. 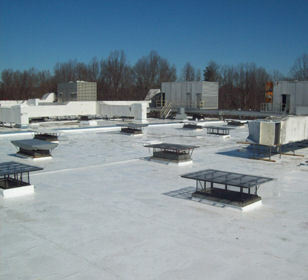 As demand increases for heat-reflective and energy efficient roofing systems, thermoplastic polyolefin (TPO) single-ply roofing membranes continue to provide exceptional resistance to ultraviolet, ozone and chemical exposure. Firestone’s TPO Systems: UltraPly TPO, Platinum TPO, ReflexEON TPO and UltraPly TPO XR, provide eco-friendly roofing system options and unsurpassed warranty coverage. As one of the leading suppliers of architectural products to the construction industry, Firestone UNA-CLAD Metal offers a variety of sustainable, dependable and environmentally friendly roofing system options. Available in a wide range of applied finishes and materials, UNA-CLAD metal allows for maximum design freedom while its Firestone Red Shield Warranty coverage provides long-term peace-of-mind. Design enhancement, energy efficiency and ease of use are just some of the features Firestone Metal Systems provide. 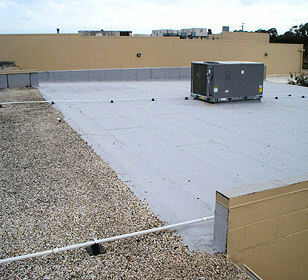 Firestone offers a variety of quality, sustainable commercial roofing systems and accessories. From polyiso insulation to reflective membranes, Firestone's product offering makes it easier to be green. 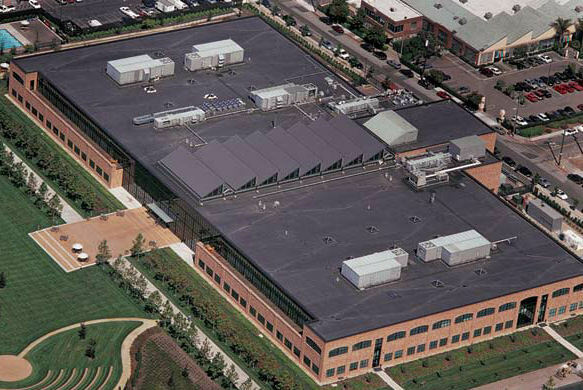 Another product to support Firestone's sustainable efforts is the EnviroReady Roofing System and Warranty, which allow users the option to install a pre-approved premium conventional roof today and upgrade that roofing project with green technology, including photovoltaic (PV) and garden roofing systems, up to seven years from the date of installation. For more information about Firestone Green Roofing Solutions please visit the Firestone Green Site or contact our Roofing Experts 1-888-766-3020 for more information. Firestone manufactures a diverse product line of base sheets, ply sheets, and cap sheets along with installation tools to give you a single source for quality asphalt-based roofing materials. Firestone APP, SBS and BUR Asphalt Systems provide a variety of roofing solutions to meet any unique design and installation. Firestone can meet all your asphalt roofing system requirements whether your design solution calls for a pre-manufactured Modified Bitumen membrane system, a standard built-up system, or a hybrid Built-Up Roofing/Modified Bitumen system. From school buildings and medical offices to prisons and construction job-site trailers, the advent of modular building technologies has hastened construction schedules and expanded design options for a wide variety of building types. Through their increased production efficiencies and cost economies, modular building systems offer an alternative to traditional construction projects, an alternative that means more effective utilization of capital resources, more building options and more flexibility for future expansion and construction designs. Firestone Modular Systems offer users an alternative to traditional construction projects. For more information about Firestone Roofing Solutions please visit the Official Firestone Website or contact our Roofing Experts 1-888-766-3020 for more information. Please also feel free to request a Free Commercial Roof Quote.